Quattroflow™, part of PSG®, a Dover company and a leading brand of positive displacement quaternary diaphragm pumps, is pleased to announce the launch of the EZ-Set Pump Chamber Replacing System for its Single-Use pumps. With EZ-Set, users can replace a Single-Use pump chamber in 30 seconds by hand without the use of special tools or torque wrenches. It’s quick, it’s easy, and it’s safe. The comfortable handgrip design of the EZ-Set makes replacing the pump chamber so easy you can do it even while wearing rubber gloves. EZ-Set also reduces downtime between batches. 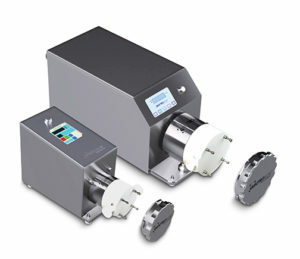 The EZ-Set is available for Quattroflow Single-Use pump chamber sizes 150 and 1200 – QF150SU, QF1200SU, QF1200SU-CV and QF1200SU-HT – and is also retrofittable on existing drives. So, standard QF150 and QF1200 Single-Use pumps can be upgraded easy and fast. To see how quick and easy the EZ-Set really is Quattroflow has produced a “How It Works” video.